KN KAREN NEUBURGER has generously offered to give away a pair of KN Chenille lounge socks to a Frugal & Fabulous reader! These socks look oh so soft! Considering it is a balmy 10' here in Massachusetts - I'd much rather be drinking hot chocolate in my jammies and in these pretty socks - what would be cozier? 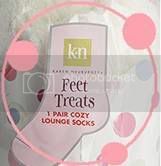 "KN KAREN NEUBURGER Feet Treats make great gifts for your guests! Give as a fun twist on a classic door prize, award to a charades champion or send each of your guests away smiling and satisfied with a comfy, cozy pair of KN KAREN NEUBURGER ’s biggest seller. Party planning is an art that requires a tier of talents: over-the-top organization, plentiful patience, a steady social schedule and, above all, consuming creativity. Unfortunately, with the sting of the economic state and the constant slew of strong winter storms, creativity may be less than looming and far from blooming as we slowly struggle to Spring. Fortunately, KN KAREN NEUBURGER has developed a tasty little treat that will make party planning fun and full of life again until what will hopefully be a positive Springtime turnaround. Consider giving these as a themed gift or for a party! KN KAREN NEUBURGER Feet Treats Cupcake Socks , chenille lounge socks packaged to perfection to resemble your favorite festive dessert, encompass all that great party products should. Cool colors and a polkadot print do not begin to describe the versatility of this little gem. See below for ways to use the KN Karen Neuburger Feet Treats to your advantage while planning one of the presently popular “Life is Sweet” themed parties." You have until Monday, January 19th @ 4:00 p.m. to enter! My fav is the Shawl Collar Double Plush Robe - Cream. It look so warm and cozy. I am going to post this as a giveaway on my freebie friday post tomorrow. My fav has to be the Shawl Collar Double Plush Robe - Cream. It looks incredibly soft. I'm going to post this give-away in my 'pulse'. Love the Hippo Girls Infant Pajamas, my 7 month old would look so cute in those! I like the camis. I'm a big fan of camis and they have great colors. I just posted about this on my blog with a link. I adore the Tickled Pink - Long Sleeve Boyfriend PJ. THey have such great stuff there. These are my favs http://www.karenneuburger.com/Heathered_Lounge_Socks__Eggplant/pd/np/113/p/1663.html - they look so comfy and warm! I could use these now with this crazy cold weather we've been having. I love the Aurora Borealls. My kind of jammies!! HI! I just linked to this post at my blog at www.taulmantimes.blogspot.com. OH my gosh! These socks look fabulous! That is what I love at her website! I love the packaging too! How cute!! When I win (LO!) you can contact me at my blog or at brspri@aol.com. I would have to go with the crop sleep pants, light blue. BTW, your link to her site is not working where you say "tell me your favorite"
I should get an extra entry for telling you that, lol! i love ALL the stationery! I could live in my Karen Neuberger pajamas. In fact, some days I do. I prefer the 3/4 sleeve nightshirts, although the ballerina long sleeve night gown looks yummy. the pink boyfriend slippers look like they have my name all over them. I love the fuzzy socks and I LOVE the pink quilt kit!! The ottoman skuff slippers look so warm. There are many things I love at her site but I have some of her pajamas ans they are so COMFY! so I decided Id pick another pair from her site the Tickled Pink - Long Sleeve Boyfriend PJ The socks would make a perfect pair with the set. I really liked the pink ribbon totebag kit. My favorite is the Pink Ribbon Tea Cup! I just love pink and this is one of the many pink things that I found at her store! Zipup robe with hood in petite size is just what I need. Most robes are so long that I look like the incredible shrinking woman in them. Nancy , I love cozy warm PJ's. in any color. 3. Favorite item: The feet treat cupcake socks (green would be my first choice). I can see myself purchasing some xmas gifts from this site..such cute stuff! 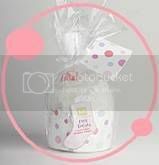 $28.00 - I have a baby girl and it is go cute. I love the pink ribbon chenile gripper socks. Thanks for the great tips, I subscribed! My favorite is the polka dot socks. So cute! I like the Heart and Snow - Snowman Long Sleeve Pullover PJ. These look so soft and warm. I like the Pink Ribbon Quilt Kit. Thanks. My fav is the Pink Chenille Breast Cancer Awareness socks - they look so comfy + they are supporting a great cause! My favorite would have to be the Tickled Pink Long Sleeve Boyfriend PJ. The Shawl Double Collar Plush Robe Cream. I really just love the socks! I'm a big sock freak! Since my feet are freezing at the moment, my favorite thing from karenneuburger.com is her ottoman skuff slipper - blue. My feet would love the comfort and warmth they would provide! I posted about your awesome giveaway on my blog. My fav have to be the fuzzy socks in general. My kiddos call them monster feet and I just LOVE socks. I was even one of the crazies that wore socks with tevas, lol. I LOVE the Alexia bedding collection! I like the Freddie & Flapjack Snugfit Infant PJ'S! My favorite is "Heart and Snow - Snowman Long Sleeve Nightshirt," I love cozy, warm stuff! Hello! Those socks do look yummy! We had windchills of -10* yesterday here in TN. Brrrr! On KN's website, I love the Whimsical Day PJ's. The long pj's always end up around my knees anyhow. lol Thank you for a great giveaway! My fave are the Diamond Plush Skuff Slipers, they look so comfy. I had never visited her site. There were lots of wonderful things on there. I would pick out something for my little girl, I think. The Hippo Girl's Infant Pajama's are sooooo cute! Whimsical Day - Floral 3/4 Sleeve looks so comfy! I love her sleepwear they are so soft on the skin. My favorite item of hers is the Whimsical Day - Floral Long Sleeve Cardigan Pajama. Thank-you for the giveaway. I subscribed through Google because I couldn't sing up through email it wouldn't work. i love the Floral Girl's Nightgown for my hannah! Loved the pink ribbon boyfriend p.j's and pink ribbon socks! Looked warm and "girly"
The soft PJs look wonderful especially when it's so cold outside!! Tried twice. I'll try again later in case this is a temp problem. Love your blog and was referred by Jane4girls. It would have to be the Whimsical Day Floral Long Sleeve Cardigan Pajama. I love the tote bags. The Hippo Nightie is just too cute! I posted on my blog about the contest. My favorite item is the sleeve night shirt. my favorite is the spa white treatment wrap. Thanks for this terrific opportunity. KN is great stuff. argyle diamond pink chenille socks - I love warm and funky socks! I work from home and I call them my work socks. I would love some more to add to my collection. I'd like the boyfriend slippers in blue. Lots of nice things though. I love the light blue kimono robe. i'm vertically challenged so i always appreciate stores that carry petite sizes! the whimsical day - floral pajamas look super comfy and cozy! Oohh I Love socks! Enter Me! I like the tickled pink sleepwear set. It looks very warm and cozy! I have a pair of these socks and I love them, Now, if they could make sheets out of the same material, life would be great. From their website, I like the Sandalwood - Floral Long Sleeve Cardigan PJ a lot. ... and I also subscribed to your blog, what a great site! I'd buy the Cropped sleep pants, so comfortable looking. i sure could use some warm socks. it was 0 degrees here yesterday morning. I like the Flower Drum - Long Sleeve Combo Henley PJ set. 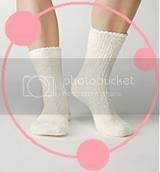 I love the socks - my feet are never warm enough - off to link this from my blog - great giveaway! I thought I had already entered, but don't see my comment. I LOVE the Think Pink quilt kit! I absolutely love her scrapbook paper & products. My favorite is the Whimsical Day pajama set. I subscribed to your post.